Every 15 minutes someone in Australia goes missing. Some of these people want to disappear; other times they tragically meet with misadventure or murder. Missing You by Justine Ford, TV producer of Missing Persons Unit, features some of Australia’s most disturbing Missing Persons cases and invites you to play armchair detective. With rare, privileged access to police around the country, and in moving interviews with the families of missing people, Missing You tells the intimate stories of Australia’s Missing, revealing clues that police hope will ultimately bring them home. 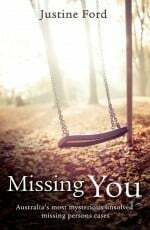 In an insightful, mysterious, and often emotional journey, Missing You features more than 20 of this country’s most baffling cases, as well as stories of unidentified remains, abductions and suspected homicides. Here you’ll find the true, in-depth stories behind this country’s most worrying disappearances, with fresh insights into recent and historic cases.